The central theme of Dr. Jia`s research program is the design and synthesis of advanced biomaterials for the treatment of human diseases. Novel polymeric materials being developed in Dr. Jia`s group include multifunctional, cross linkable micro- and nano-particles that are attractive drug delivery vehicles and synthetic extracellular matrices that resemble their natural counterparts structurally and functionally. The synthetic matrices, combined with defined mechanical cues and biological factors, create a three dimensional microenvironment for the engineering of healthy (vocal folds, salivary gland and cartilage) and pathological tissues (cancer). 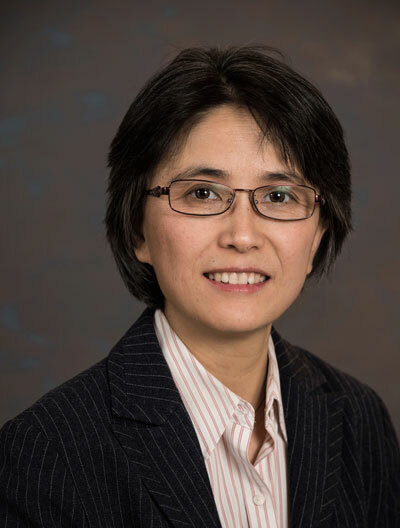 Dr. Jia`s primary focus is on the synthesis of functional biomaterials for drug delivery and tissue engineering applications. It is well-recognized that most polymeric implants currently used cause biological encapsulation and foreign body reaction that impair their performances. Ultimately, the implants have to be surgically removed in order to avoid further complications. To mimic the nanoscale topographical features of the natural ECM, we are investigating surface engineering methodology to create functional biointerfaces. We are exploring a range of approaches for the fabrication of surfaces with well-defined topography at the nanometer scale. These nanostructured surfaces are interesting platforms to explore the effects of nanometer scale topography on protein adsorption, and subsequently cell behavior. We are interested in designing surfaces that not only selectively anchor a particular type of protein, but also preserve its natural conformation. Since cells interact with surfaces through the adsorbed protein layer, these surfaces will provide orchestrated healing “signals” to arriving cells, leading to benign cellular reactions and eliminating fibrous capsule formation. Elastin is a natural polypeptide with distinct elastomeric properties. Elastin achieves its excellent mechanical properties through a multiblock copolypeptide structure composed largely of two types of short segments that alternate along the polypeptide chain: highly flexible hydrophobic segments composed of VPGVG repeats, with many transient structures that can easily change their conformation when stretched; and alanine- and lysine- rich alpha-helical segments, which form crosslinks between adjacent molecules via the action of lysyl oxidase in the ECM. Intrigued by the entropic origin of elastin elasticity, we have been engaged in developing multiblock peptide-polymer hybrid polymers consisting of hydrophobic flexible synthetic polymer alternating with alanine-rich peptides that are the structural component of the hydrophilic crosslinking domain of the natural elastin. These hybrid polymers were constructed by condensation polymerization via Orthogonal Click Chemistry using flexible synthetic polymers and alanine-rich, lysine-containing peptides as the building blocks. Subsequent covalent cross-linking of the pre-registered lysin residue led to a strong and elastomeric hydrogels. Hyaluronic acid (HA) is a ubiquitous nonsulfated GAG in ECM. It is naturally biocompatible and biodegradable. It plays critical roles in cell adhesion, differentiation, motility, morphogenesis and wound healing. We have developed HA-based multifunctional hydrogels with defined biological functions, hierarchical structures and tunable viscoleasticity. Chemical modification of HA was applied to install reactive handles to HA. Inverse emulsion polymerization allows for HA hydrogel particles (HGPs) to be synthesized. Mixing of water soluble HA derivative with HA HGPs carrying complementary functional groups resulted in the formation of doubly crosslinked networks (DXNs). Controlled release of bone morphogenetic protein 2 (BMP-2) was achieved through its anchorage at predetermined locales within the DXN using covalently immobilized perlecan domain I as the ligand reservoir. The HA-based, BMP-2 releasing matrices are capable of stimulating chondrogenic differentiation of the cultured mesenchymal stem cells. Recent biophysical studies using nanotools revealed a diverse set of structural motifs in ECM that could change conformation over a range of mechanical forces. Such force-induced changes ultimately produce changes at the biochemical level that effectively direct cellular behaviors. Synthetic biomaterials with the ability to respond rapidly and reversibly to mechanical stresses over prolonged periods of time in the human body have yet to be developed. To mimic the modular domain structures of functional proteins in natural ECM, we are exploring the use of specific and reversible supramolecular interactions in combination with well-defined polymer synthesis and surface engineering methodologies to construct dynamic and mechano-responsive materials. We anticipate that the unique hierarchical design combined with well-defined polymer chemistry will give rise to materials that exhibit a combination of strength, reversibility, and energy absorption as seen in their natural analogues. The ability of systematically varying the matrix mechanical properties is likely to offer handles for the determination of cell behaviors. We are interested in engineering polymer-based nanocarriers for the targeted delivery and controlled release of cancer chemotherapeutics. These nanoparticle theapautics will improve the efficacy of the cancer treatment, at the same time, reduce the toxic side effects to the normal tissues. Towards this goal, we are synthesizing amphiphilc block copolymers based on poly(ethylene glycol) and poly(epslon-caprolactone) containing distinctly different and readily accessible functional groups in both blocks. The block copolymers self-assemble into defined core-shell structure in aqueous environment. The presence of specific drug-polymer interactions not only increase the stability of the nanoparticles but also improve the pharmacokinetics and pharmacodynamics of the encapsulated drugs. Drug-loaded nanoparticles are further decorated with moieties that target the specific cancer tissues. Nanoparticle toxicity, specificity and biodistribution are systematically analyzed using both in vitro and in vivo models. Radiation therapy for head and neck cancer results in atrophy, fibrosis, and degeneration of salivary gland tissue, leading to salivary gland hypofunction and xerostomia. This condition affects approximately 40,000 new patients annually in the US. Xerostomia after radiation therapy results in inability to comfortably swallow, taste or articulate. Salivary immune dysfunction after radiation results in dental decay and oral cavity infections. The quality of life in cancer survivors is markedly diminished. Currently, there is no preventive or curative therapy for xerostomia. We are developing tissue engineering strategies for functional salivary gland regeneration. Hyaluronic acid (HA) is enriched in tumors or the stroma surrounding the tumors. Interactions between HA and its receptors (CD44 and RHAMM) increase the invasive potential by binding with bone marrow endothelial cells and facilitating intravasation into the new tumor site. We hypothesize that HA-baed 3D hydrogel matrices will provide biomimetic microenvironments for the growth of cancer cells. Fundamental studies using these matrices will not only improve our understanding in basic cancer cell biology but also lead to improved methods for the prevention and treatment of the disease. In the current study, C4-2B cells of the LNCaP line were encapsulated in HAALD/HAADH gels in situ. The cell-laden matrices were incubated for one week with or without added anticancer drugs. Cells cultured in the HA gels showed a higher apoptosis response than did those on plastic, possibly due to more natural cell morphology, 3D cell-cell contact as well as the altered gene expression and signaling. The HA hydrogel system provides a useful new alternative to study anti-neoplastics on poorly adherent cell types such as those which have metastasized to the bone marrow and have the potential to expand the list of prostate cancer cells for high-throughput testing. The human vocal folds are paired structures that are brought into contact across the airway for sound production. Each vocal fold consists of a pliable vibratory layer of connective tissue, known as the lamina propria (LP), sandwiched between epithelium and muscle. The lamina propria plays a critical role in the production of voice as its shape and tension determine the vibratory characteristics of the vocal folds. Under normal conditions, vocal folds can sustain up to 30% strain at frequencies of 100 to 1000 Hz. Mechanical stresses and pathological conditions can disrupt the natural pliability of LP, resulting in vocal fold disorders ranging from benign nodules to laryngeal cancer. Successful engineering of functional vocal fold lamina propria relies on the strategic combination of multipotent cells, physiologically relevant mechanical stimulations and biomimetic matrices. Jha, A. K.; Yang, W.; Kirn-Safarn, C. B.; Farach-Carson, M. C.; Jia, X. * “Perlecan Domain I-Conjugated, Hyaluronic Acid-Based Hydrogel Particles for Enhanced Chondrogenic Differentiation via BMP-2 Release” Biomaterials, 2009, 30, 6964-6974. Grieshaber, S. E.; Farran, A. J. E.; Bai, S.; Kiick, K. L.*; Jia, X. * &quot;Tuning the Properties of Elastin Mimetic Hybrid Copolymers via a Modular Polymerization Method&quot; Biomacromolecules, 2012, 13, 1774–1786. Teller, S. S.; Farran, A. J. E.; Xiao, L.; Jiao, T.; Duncan, R. L.; Clifton, R. J.; Jia, X. * “High Frequency Viscoelastic Shear Properties of Vocal Fold Tissues: Implications for Vocal Fold Tissue Engineering” Tissue Eng Part A, 2012, 18, 2008–2019. Tong, Z.; Duncan, R. L.; Jia, X. * “Modulating the Behaviors of Mesenchymal Stem Cells via the Combination of High Frequency Vibratory Stimulations and Fibrous Scaffolds” Tissue Eng Part A, 2013, 19, 1862–1878. Xiao, L.; Tong, Z.; Chen, Y.; Pochan, D. J.; Sabanayagam, C. R.; Jia, X. * “Hyaluronic Acid–Based Hydrogels Containing Covalently Integrated Drug Depots: Implication for Controlling Inflammation in Mechanically Stressed Tissues” Biomacromolecules, 2013, 14, 3808–3819. Dicker, K. T.; Gurski, L. A.; Pradhan–Bhatt, S.; Witt, R. L.; Farach–Carson, M. C.; and Jia, X. * “Hyaluronan: A Simple Polysaccharide with Diverse Biological Functions” Acta Biomaterialia, 2014, 10, 1558–1570. Xu, X.; Sabanayagam, C. R.; Harrington, D. A.; Farach–Carson, M. C.; Jia, X. * “A Hydrogel–Based Tumor Model for the Evaluation of Nanoparticle–Based Cancer Therapeutics” Biomaterials, 2014, 35, 3319–3330. Tong, Z.; Zerdoum, A. B.; Duncan, R. L.; Jia, X. * “Dynamic Vibration Cooperates with Connective Tissue Growth Factor to Modulate Stem Cell Behaviors” Tissue Eng Part A, 2014, 20, 1922–1934. Liu, S.; Zhang, H; Remy R. A.; Deng, F.; Mackay, M. E.; Fox, J. M.*; Jia, X. * “Meter–Long Multiblock Copolymer Microfibers via Interfacial Bioorthogonal Polymerization” Adv Mater, 2015, 27, 2783–2790. Krishnan, V.; Xu, X.; Kelly, D; Snook, A.; Waldman, S. A.; Mason, R. W.; Jia, X.; Rajasekaran, A. K.* “CD19–Targeted Nanodelivery of Doxorubicin Enhances Therapeutic Efficacy in B–cell Acute Lymphoblastic Leukemia” Mol. Pharmaceutics, 2015, 12, 2101–2111. Ozdemir, T; Fowler, E. W.; Hao, Y.; Ravikrishnan, A.; Harrington, D. A.; Witt, R. L.; Farach–Carson, M. C.; Pradhan–Bhatt, S.; Jia, X. * “Biomaterials–Based Strategies for Salivary Gland Tissue Regeneration” Biomater. Sci. 2016, 4, 592–604. Han, Z.; Trout, W. S.; Liu, S.; Andrade, G. A.; Hudson, D. A.; Scinto, S. L.; Dicker, K. T.; Li, Y.; Lazouski, N.; Rosenthal, J.; Thorpe, C; Jia, X.; Fox, J. M.* “Rapid Bioorthogonal Chemistry Turn–on through Enzymatic or Long Wavelength Photocatalytic Activation of Tetrazine Ligation” J. Am. Chem. Soc. 2016, 38, 5978–5983. Ravikrishnan, A.; Ozdemir, T.; Bah, M.; Baskerville, K. A.; Shah, S. I.; Ayyappan, R. K.; Jia, X. * “Regulation of Epithelial-to-Mesenchymal Transition Using Biomimetic Fibrous Scaffolds” ACS Appl. Mater. Interfaces 2016, 2016, 8, 17915–17926.